¿Qué podría no gustar de una línea de fragancias orquestada exclusivamente alrededor de la reina de las flores? Les Parfums de Rosine es una casa creada (o, mejor dicho, re-creada) por Marie Helene Rogeon, quien decidió unir sus dos pasiones: el perfume y las rosas. La Srta. Rogeon revivió la casa que había sido originalmente fundada por el legendario modisto Paul Poiret a comienzos de 1900s. Hoy la marca explora y exalta todos los aspectos de esta flor: desde la brisa salina de Une Rose au bord de la Mer al frutado Rose d’Eté pasando por las maderas de Poussière de Rose y sus matices de té y frutas secas. La casa ofrece también algunas creaciones dirigidas específicamente al público masculino (Rose d’Homme, Twill Rose, Rosissimo). Los perfumes son bonitos, sin complicaciones y de calidad noble. La fragancia más emblemática de Les Parfums de Rosine es La Rose de Rosine, una rosa arquetípica y de proporciones clásicas. Fue compuesta por Francois Robert en 1991, quien se basó en un perfume original de 1912. La Rose de Rosine es innegablemente femenina y refinada: no es una flor para exteriores, sino una rosa civilizada que se siente cómoda en los salones más elegantes y luce mejor con perlas y maquillaje. Si bien podría ser descripta como madura por algunos, su belleza es evidente e innegable. La Rose de Rosine se presenta bajo la apariencia de un enorme e insolente ramo de rosas en flor; un poco jabonoso, un poco atalcado -gracias al haba tonka– y acompañado por la marcada presencia de la violeta. Las rosas son aterciopeladas, de color rosado y casi táctiles. No puede evitarse notar una semejanza con (la versión pre-reformulación de) Paris, pero en términos generales el Rosine se percibe como más cálido y cremoso. La longevidad es muy buena y el sillage, bastante amplio. What’s not to love about a fragrance line orchestrated exclusively around the queen of flowers? Les Parfums de Rosine is a house created (or re-created) by Marie Helene Rogeon who decided to unite her two passions: perfume and roses. Ms Rogeon resurrected the house that had been originally founded by legendary couturier Paul Poiret in the early 1900s. Today the brand explores and exalts all the aspects of the flower: from the salty breeze of Une Rose au bord de la Mer to the fruity Rose d’Eté to the woody Poussière de Rose, with its hints of tea and dried fruits. The house also offers a few creations targeted specifically towards the male audience (Rose d’Homme, Twill Rose, Rosissimo). The fragrances are pretty, uncomplicated and of noble quality. The most emblematic creation from Les Parfums de Rosine is La Rose de Rosine, an archetypal rose of classic proportions. It was composed by Francois Robert in 1991, based on an original fragrance from 1912. La Rose de Rosine is feminine and refined: this is not a flower for the outdoors but a civilized rose that feels at ease in the most elegant rooms and should be worn with pearls and makeup. While it might be described as mature by some, its beauty is evident and undeniable. La Rose de Rosine appears under the guise of a big unabashed bouquet of roses in full bloom; a bit soapy, a bit powdery -thanks to tonka bean– and paired with the marked presence of violet. 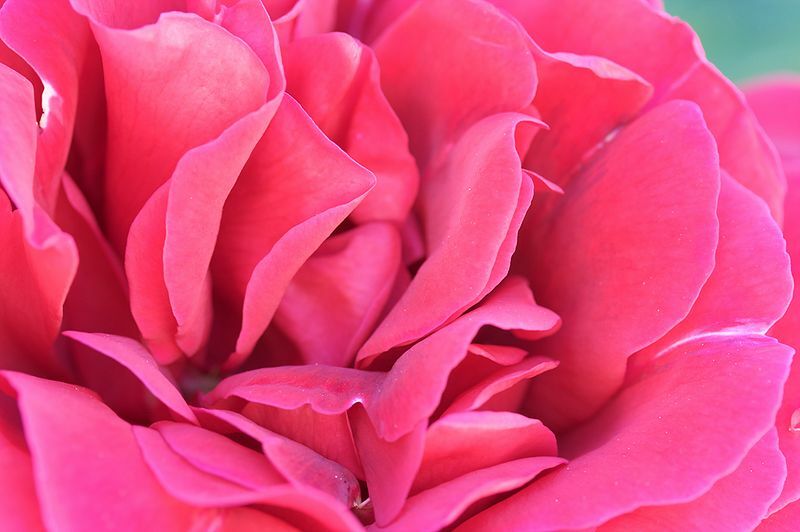 The roses seem pink, velvety and almost tactile. One cannot ignore its resemblance with (pre-reformulation) Paris but in general terms the Rosine is perceived as creamier and warmer. Its longevity is very good and the sillage, quite ample. This entry was posted in Perfumes, Reseñas - Reviews and tagged almizcle - musk, bálsamo del Perú - Peru balm, benjuí - benzoin, Francois Robert, iris, jazmín - jasmine, Les Parfums de Rosine, Marie Helene Rogeon, Paul Poiret, rosa - rose, tagetes, tonka, violeta - violet, ylang ylang. Bookmark the permalink. I haven’t tried this one yet. I’m only familiar with Rose d’Homme and Zeste de Rose. Hi Lukasz, La Rose de Rosine has been a staple of mine for years (I also have a backup bottle). My other favorites from the line are Poussière de Rose and Roseberry. I remember sniffing Rose d’Homme and liking it very much. Unfortunately, I was unable to give it enough time.